The marine diesel engine that powers your boat is a relatively simple beast. Compared with the gasoline engine powering your car, diesels are uncomplicated, and routine maintenance will assure years of reliable service. This article distills the wisdom of the experts down to some basics for you, the owner of a diesel-powered boat, to keep in mind. This first topic is a no-brainer. The manufacturers of your engine almost invariably produced an excellent manual, containing all the information you need to keep your engine chugging reliably along. You don’t need to read the rest of this article if you just read that document and follow its instructions for recommended maintenance! Just read it and do as advised. Next, keep track of this maintenance using an hourmeter. If your engine doesn’t have an hourmeter, buy and install one. Then you can log the maintenance performed by you, or your mechanic. I’ll add here that you should find a local mechanic you can trust, and establish a regular relationship with him (or her). 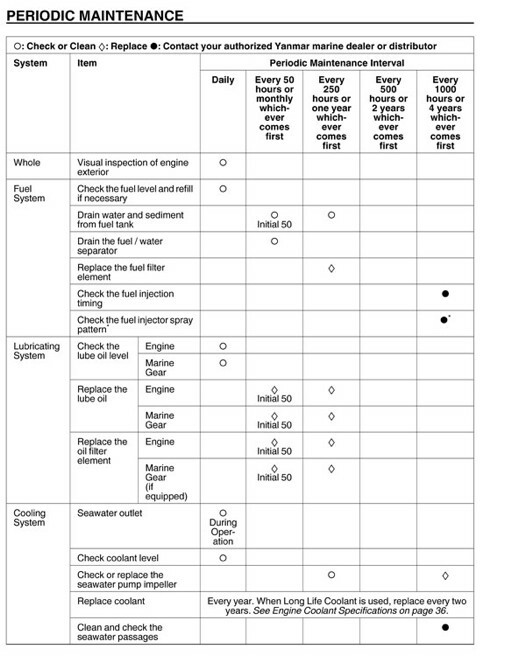 If you’ve just bought a used boat, get a quick diagnostic of the engine and all its systems. Especially, you should ensure that the alarm system and gauges are working. Then, if the engine overheats or loses oil pressure, the problem is a nuisance, resulting in a call to Tow BoatUS, instead of a catastrophe where you need a new engine. Looking at your manual, you’ll find a Periodic Maintenance table. 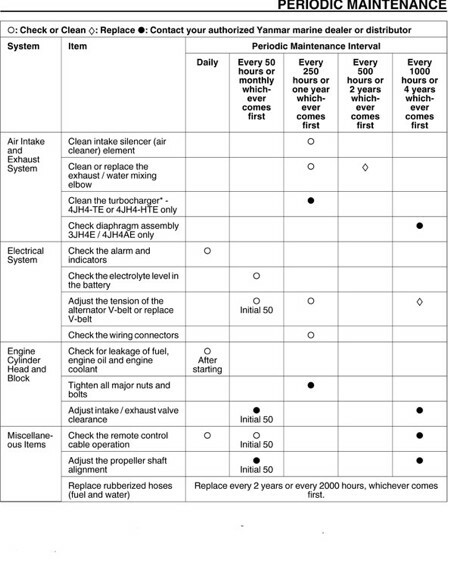 This lists all of the scheduled maintenance for your engine. Below is the table for my three-cylinder Yanmar 3JH4E engine. It’s pretty typical of what you’ll find for your own diesel. As you can see, there’s a lot in this table! If the frequency and quantity of these tasks overwhelms you, you’re likely to get into trouble, and if you’re new to boating, consider this carefully before buying a diesel-powered vessel. But if you follow the recommended schedule, you can ensure your fishing trip or cruising adventure won’t be ruined by engine problems. That was the general overview to get you started in the right direction. Below, we’ll look at the three most critical groups of components, the lubrication, cooling and fuel systems in your engine. Most owners understand that frequent oil changes are a must. The typical interval is every 100 hours, but this varies from as few as 50 to as many as 200 hours (small engines like my 1.6 Liter Yanmar take only a small quantity of oil, and need more frequent oil changes, in this case, every 50 hours). Oil in a diesel works hard—much harder than in a gas engine—because the engine works at a high temperature and under extreme pressure. Diesel oil also contains traces of sulfur, especially in countries other than the U.S., which gets transformed into destructive sulfuric acid inside your engine. Also, many boats, especially small cruising sailboats, operate their engines infrequently and for short periods of time, when pulling into or out of their slip. They may also run the engine for long time periods at low RPM, for charging battery banks or freezing the refrigerator’s holding plate. Both of these practices are rough on your engine. The engine doesn’t warm up to operating temperature, causing moisture to condense inside, creating sulfuric acid and also a buildup of carbon. If this carbon remains inside your engine, the lubricating ability of the oil is substantially reduced. Plus, this buildup of soot coats valves and valve stems, which reduces the compression of your engine. All the experts agree that you should avoid running the engine for short durations and/or at low loads. If you do a lot of this type of motoring, you’re going to need more frequent oil changes with top-quality oil and good filters. Before purchasing new oil, remember that oil that is great for a gasoline inboard is not always right for a diesel. Your owner’s manual should state the API (American Petroleum Institute) and SAE (Society of Automotive Engineers) ratings that denote the correct oil for your engine. These ratings should appear on the container of the oil you buy. API ratings that begin with the letter C (for Compression ignition) are formulated for use in diesel engines. Ratings that begin with the letter S (for Spark ignition) are formulated for gasoline engines. The letters C or S are followed by a second letter that indicates the complexity of the additive package. These letters ascend up the alphabet. Oils containing more complex additive packages can, in general, be used with prior formulations. For example, if you own a diesel and the manual says, “use CD”, oil rated CE will be fine. Many oils are now formulated for use with both gasoline and diesel engines. 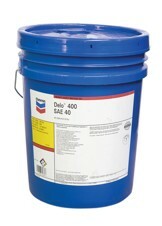 For example, Chevron’s 30 and 40 weight DELO 400 is currently rated CJ-4 and SM. The SAE rating for the oil's viscosity should also appear on the container. Viscosity is a measure of an oil’s thickness and ability to flow at certain temperatures. Higher numbers indicate thicker oil, which protects better in high temperatures. If you operate your boat in a wider temperature range, select multi-viscosity oils (e.g. SAE 10W-30). They behave like thin oils in cold weather, making it easier to crank the engine. In high temperatures they work like heavier oils, increasing the level of protection. The majority of engine failures are caused by problems in your engine’s cooling system, so pay attention here or, better yet, watch this video from Ed Sherman of the American Boat and Yacht Council (ABYC). He takes you on a tour of the cooling system on a new Volvo Penta engine and shows some basic maintenance practices. The boat in the ABYC video uses a raw water system with a heat exchanger, connected to a freshwater loop that cools the engine. This is the most common type used in recreational marine diesels. Typical problems happen when there is a blockage of the flow in the raw water side of the system. 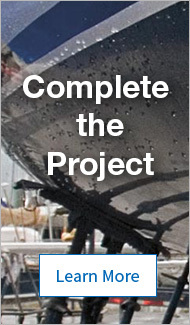 Perhaps there’s plastic debris, kelp or barnacles obstructing the raw water inlet outside the hull. Most often, the impeller in the raw water pump disintegrates. Check the Raw Water Strainer to make sure it is not clogged by debris. When this happens, your engine overheats very quickly. This is much more serious in a diesel engine than in gas-powered boats. Since diesels run at piston compressions of 350psi to 500psi, which is three to four times that of a gas engine, heat builds up very rapidly. Within 60 seconds, this high compression builds up a lot of heat that can do damage. Because your cooling system is so critical, owners of inboard diesels routinely check their wet exhaust every time they start up the engine. If you hear the usual burbling and belching sound, you’re fine. If not, shut down the engine immediately! 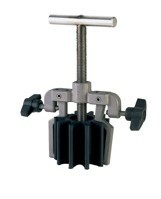 Nigel Calder recommends this Impeller Puller tool. Since the impeller is the component that’s most likely to fail—and often at the worst possible time—you should carry a spare onboard, and know how to change an impeller while you’re on the water. Nigel Calder and others recommend an Impeller Puller Tool that will make changing your impeller a lot easier. See our West Advisor called Impeller Replacement 101 for more details. Diesel engines have at least three coolers, the oil and fuel coolers, the heat exchanger, and probably also a transmission cooler. All need inspection and service at least once a year. There will be pencil anodes in the raw water side of the system to protect these coolers from internal corrosion, and these should be checked annually, or your heat exchanger could be eaten up by corrosion. If this sounds expensive and complicated, rest assured that regular maintenance is less costly than replacing an engine or two! Okay, we’re being repetitive here, but clogged fuel filters will shut your engine down. Lack of fuel won’t damage your engine, but could put your boat in a dangerous situation if the engine shuts down at the worst possible time—as it often will. Water can accumulate in your fuel tank, especially when the boat sits unused with a tank that is partially or mostly empty. When I bought my Cal 40, which had been neglected for about three years, I took it to a “fuel polisher,” a specialist who removed all the diesel and pumped it through a series of filters. He opened and cleaned my fuel tank and then replaced both the primary and secondary filters. This gave me confidence before making a long offshore delivery, as ocean waves can stir up sludge from the bottom of the tank and clog your filters. Your boat should have both a primary filter and a secondary filter, which is usually mounted on the engine itself. Primary filters remove water and larger particles in your fuel. Primary filters with clear sediment bowls are great for a visual check, and the #2 diesel should look red in color. You can see water in the bottom of the bowl and drain it easily. Centrifugal filters, like the Racor Turbine Series, are a three-stage system that removes nearly all of the water and all of the harmful solid particles in the fuel. 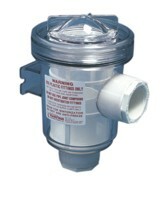 Double-manifold versions, such as the MAX Turbine Series, have a valve that lets you isolate one filter for service while the other keeps operating. They also include a vacuum gauge to let you know when the filters are clogging up and need to be replaced. Experts, like my local fuel polisher, advise adding a gauge like the T-Handle Gauge Kit, and keeping track of the readings. Then you know how regularly your filters need replacement. In general, they need to be replaced at least once per year. Adding a fuel biocide, like Biobor, is good insurance against fuel-borne microbes. 30-micron filter elements are used as a primary filter when the secondary filter is left in place on the engine. There has to be a secondary filter! 10-micron filter elements are used either as a primary or secondary filter, depending on whether 10 micron filtration meets the engine manufacturer’s recommendations. When used as the only engine filter, there is no reason not to leave the existing engine filter in place. 2-micron filters can be used as the only filters in the system. Since they remove almost every trace of water and dirt, they will need to be replaced more often than filters that allow more dirt to get through. 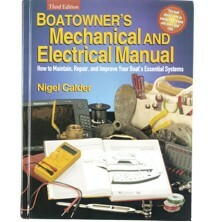 Nigel Calder’s Boatowner’s Mechanical and Electrical Manual is a fantastic resource for maintaining your boat. Maintaining your diesel engine (or engines, in the case of twin-engine boats) is not a mystery. You don’t need to be a mechanic or a “Boat Whisperer.” This article has scratched the surface of engine maintenance, and you can get lots of great information from the Boatowner’s Mechanical and Electrical Manual, by Nigel Calder. His Marine Diesel Engines is likewise a great source of detailed knowledge. With a little regular care and TLC, your diesel will keep on keeping on, happily chugging along hour after hour, taking you to your next port of call and safely home again.